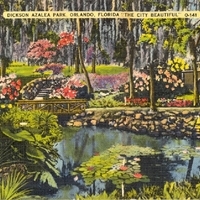 Postcard showing the Dickson-Azalea Park, owned by the City of Orlando. The park is located south of Robinson Street, north of Central Boulevard, and west of Rosearden Drive. Fern Creek runs through the park, which drains into Mayor Carl T. Langford Park located directly south of Dickson-Azalea. The park is intersected by Washington Street. Washington Street goes over the park with a early white concrete bridge, one of the landmarks of downtown Orlando. Much of Dickson-Azalea Park is below the street surface as if follows the banks of Fern Creek. The park is a garden with mostly native plants and Fern Creek is crossed by several paths and foot bridges. Original 5.5 x 3.5 inch color postcard by Tichnor Quality Views, 1938: Orange News Company, Orlando, Florida: Private Collection of Thomas Cook. Digital reproduction of original 5.5 x 3.5 inch color postcard by Tichnor Quality Views, 1938: Orange News Company, Orlando, Florida. Postcard Collection, Thomas Cook Collection, RICHES of Central Florida. Originally created by Tichnor Quality Views and published by Orange News Company. Copyright to this resource is held by Tichnor Quality Views and is provided here by RICHES of Central Florida for educational purposes only. "Dickson Azalea Park." City of Orlando. http://www.cityoforlando.net/blog/parks-spotlight-dickson-azalea-park/. Rajtar, Steve. A Guide to Historic Orlando. Charleston, SC: History Press, 2006. Ferns, oaks, elephant ears, lilies and azalea plants make Dickson Park in Fern Creek ravine, Orlando, one of Florida's garden spots. The colorful azaleas are of species blooming at different intervals throughout the year, thus making year around beauty. YEWS QUALITY TIEHNOR ORANGE NEWS CO., ORLANDO, FLA.
ORLANDO OCT 5 1130 AM 1938 FLA.
Tichnor Quality Views. “Dickson Azalea Park Postcard.” RICHES of Central Florida accessed April 20, 2019, https://richesmi.cah.ucf.edu/omeka/items/show/1351.